Forward Will Barton is one of five stud sophomores on Memphis. When you’re filling out your NCAA tournament brackets this week, don’t be deceived by these five teams. They are the snakes lurking in the weeds, waiting to poison any chance you have at winning your pool. These teams are all much better than their seeds would suggest and each has a legitimate chance of making some noise in the coming weeks. The Tigers have been on cruise control lately. Memphis has won seven straight, each by double digits with an average margin of victory of 22.7. Most recently, the Tigers dominated the Conference-USA tournament, beating Central Florida by 31 in the semifinals before trouncing Marshall by 26 in the final. Memphis is one of just ten teams to enter the NCAA Tournament with a top 25 offense and defense, according to KenPom. The Tigers currently have the 19th ranked offense and the 13th ranked defense. Memphis’ profile is very similar to the average Final Four team of the last nine years. Since 2003, the average offensive rank of a Final Four team is 13.89 and the average defensive rank is 17.44. 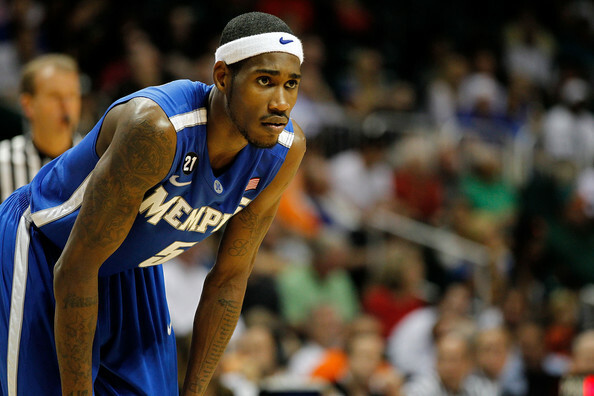 Memphis is led by sophomore Will Barton (18.1 ppg, 8.1 rpg, 3.0 apg), who is having an All-America type season. The 6-5 forward leads the Tigers in points and rebounds and has an offensive rating of 116.1 (24th in the nation). Forward Tarik Black (10.9 ppg, 4.9 rpg, .686 FG%) is one of the most efficient scorers in the country. He ranks second in the nation in effective field goal percentage (68.6) and fifth in true shooting percentage (67.3). The Tigers also have two solid ball distributors. Guards Joe Jackson (11.1 ppg, 3.8 apg, 1.3 spg) and Chris Crawford (9.3 ppg, 3.9 apg, 3.1 rpg) both have assist rates over 25.0. Ouch, the Tigers got the shaft from the committee. Not only did Memphis receive an 8-seed, they also drew St. Louis in the first round. Like Memphis, the Billikens are much better than their seed would suggest, they are a top-20 team in both the KenPom and Sagarin rankings. If the Tigers can get past St. Louis, they’ll get No. 1 seed Michigan State in a match-up of top-15 teams. Rebounding may be the Tigers’ downfall against Tom Izzo’s squad. Memphis has not rebounded well this year, they rank 232nd in offensive rebounding and 173rd in defensive rebounding. The Spartans on the other hand rank 25th in both offensive and defensive rebounding. 7-footer Garrett Stutz will pose match-up problems for opposing teams. I wrote gushingly about Wichita State a couple weeks ago, and my opinion hasn’t changed. The Shockers are one of the ten best teams in the country and are a serious threat to go far in the NCAA Tournament. The Shockers had won 17 of their previous 18 games (the one loss was in triple overtime at Drake) before losing to Illinois State in the semifinals of the Missouri Valley Conference tournament. They had also won seven straight games by 13 points or more. Like Memphis, Wichita State is one of ten teams in the nation to have both a top 25 offense and defense. The Shockers rank ninth in offensive efficiency and 18th in defensive efficiency. Wichita’s success on offense can be explained by their high shooting percentages and their ability to take care of the ball. The Shockers rank 14th in two-point field goal percentage, 60th in three-point field goal percentage, 13th in effective field goal percentage and 47th in turnover percentage. The Shockers have excelled on defense by allowing a low field goal percentage (23rd in effective field goal percentage allowed) and few second chances (sixth in offensive rebounding percentage allowed). Their defense has been superb without forcing a high percentage of turnovers (18.6 percent, 259th in the country). According to KenPom, the Shockers are the third most experienced team in the nation and second most experienced team in the NCAA Tournament (behind Pat Knight’s awful, horrible group of seniors at Lamar). Of the Shockers’ main rotation of seven, five players are seniors and two are juniors. While Wichita hasn’t made the NCAA Tournament since 2006 – before any of their current members were on the team – the Shockers won the NIT last season. In my eyes, the squad gained more tourney experience from that run to Madison Square Garden than they would have from a loss in the first round of the NCAAs. Led by seniors Joe Ragland and Toure’ Murry, the Shockers have the type of backcourt that long tournament runs are made of. The sharp-shooting Ragland has been one of the best, most-efficient guards in the nation this season. The senior has an effective field goal percentage of 67.0 (third in the nation), a true shooting percentage of 70.4 (first in the nation) and an offensive rating of 128.7 (ninth in the nation). In comparison, sweet-shooting Steph Curry had a 60.7 effective field goal percentage and 64.0 true shooting percentage in 2008, the year he took Davidson to the elite eight. 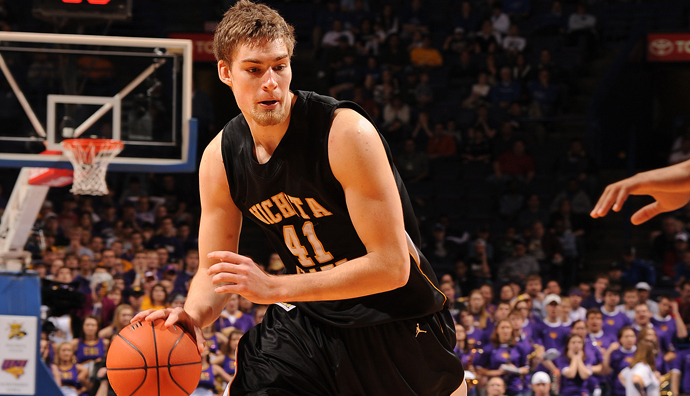 The Shockers also have a solid interior presence, led by 7-footer Garrett Stutz. As mentioned earlier, Wichita allows very few second chances on defense, ranking ninth in the country in offensive rebounding percentage allowed. A lot of that can be attributed to the strong defensive rebounding ability of Stutz. The senior center has a defensive rebound percentage of 27.0, which ranks 14th in the nation. Stutz also does a nice job on the offensive glass, grabbing 9.8 percent of his offensive rebounding opportunities. Stutz also uses his size to take a good number of high-percentage shots and he converts on them, posting an effective field goal percentage of 57.3 and a true shooting percentage of 61.9. The Shockers didn’t get any favors from the committee either. Wichita State will face a pesky VCU squad in the first round. After their success last season, I expect the Rams to be a popular 12-5 upset pick, but I think the Shockers will hold their own. VCU likes to bring havoc on defense and they force the most turnovers in the nation. However, I think the Shockers have the type of guards in Ragland, Murry and Demetric Williams to be able to take the Rams’ pressure in stride. The Shockers would then be staring down match-ups with Indiana and Kentucky. It won’t be easy, but I still think Wichita State can hang with any team in the country, so I won’t count out a deep run by the Shockers. Ken Pomeroy gives the Shockers a 17.8 percent chance to reach the Elite Eight and a 11.8 percent chance to reach the Final Four. Drew Gordon (32) is one of the best defensive rebounders in the country. 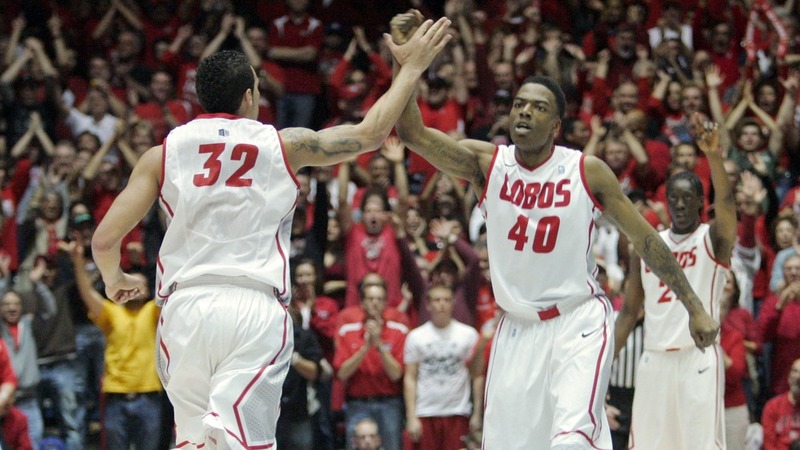 The Lobos, champions of the Mountain West Conference tournament, have never gotten the respect they deserve this season. Despite ranking highly in the computer polls all year, the coaches and AP voters have been reluctant to include New Mexico in their rankings. The Lobos were unranked in both polls last week, but no one should be caught off guard if New Mexico wins a few games in the NCAA Tournament. The Lobos are currently No. 13 in the KenPom rankings and their strength all year has been on defense. The Lobos rank 13th in adjusted defensive efficiency and 39th in adjusted offensive efficiency. New Mexico has done a great job on defense, but their success has not been highly reliant on forcing turnovers. Just 21.3 percent of their defensive possessions have ended with a turnover, the 119th highest mark in the nation. As Luke Winn examined, this could be a good sign for the Lobos. High seeds whose defensive success is heavily reliant on forcing turnovers tend not to have the same success in the NCAA Tournament. The Lobos ranked 24th in defensive rebounding, allowing opposing offenses to grab just 27.3 percent of available boards. Forward Drew Gordon (13.4 ppg, 10.9 rpg, 1.2 apg) is a beast on the defensive glass. He grabbed 29.0 percent of available boards on defense this season, the fourth best mark in the nation. On offense, 64.8 percent of the Lobos’ made baskets were assisted on, the third highest rate in the country. New Mexico had four players — Demetrius Walker, Kendall Williams, Jamal Fenton and Hugh Greenwood- who had an assist rate of 20.0 or more. Like VCU, I believe Long Beach State will be a popular 12 over 5 upset pick. However, New Mexico is a really tough match-up for the 49ers, and I think the Lobos have a very good chance of knocking off Long Beach State and Louisville. That would set up a great Sweet 16 game between New Mexico and Michigan State, two of the best defensive rebounding teams in the country. A showdown between seniors Drew Gordon and Draymond Green would be highly enjoyable. 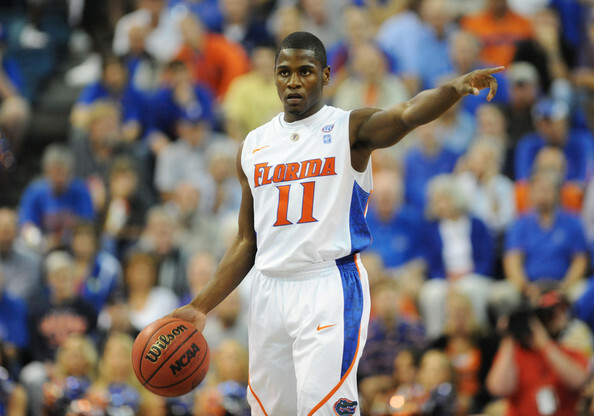 Erving Walker is part of the Gators’ talented trio of guards. I have been down on Florida all season, but I can’t deny that the Gators are a dangerous, talented 7-seed. On the surface, the Gators are very similar to 2-seed Mizzou, but with worse defense, less success and perhaps more talent (Florida has two projected first round picks in Bradley Beal and Patric Young). Unlike the other teams on this list, I’m not arguing that the Gators should have received a higher seed. Florida had a disappointing season, losing 10 games including four of their last five and six of their last 10. According to KenPom, Florida has the third most efficient offense in the country. The Gators shoot a high percentage (54.8 effective field goal percentage, 8th in the nation) and take good care of the ball (16.6 turnover percentage, 14th in the nation). The Gators boast a trio of highly-efficient guards in Kenny Boynton (16.3 ppg, 2.4 rpg, 2.5 apg), Erving Walker (12.1 ppg, 2.8rapg, 4.7 apg) and Bradley Beal (14.6 ppg, 6.5 rpg, 2.2 apg). Each has an offensive rating higher than 110. Florida relies heavily on their three-point shooting as 39.1 percent of their points this season came from three-pointers, the third highest mark in the nation. Luckily, the Gators were a good three-point shooting team, hitting on .390 percent of their attempts, 19th best in the country. The Gators have four players who attempted 120 or more three-point shots this season: Boynton (246), Walker (175), Beal (167) and Erik Murphy (120). Two Gators, Boynton (.427) and Murphy (.442) had three-point field goal percentages above .400. Unfortunately for the Gators, they rank 119th in defensive efficiency. Florida allows opponents to shoot a high percentage (48.9 effective field goal percentage, 176th in the nation), especially from behind the three-point line where teams have shot .356 percent this season. Florida also ranks 188th in turnover creation and 132nd in defensive rebounding. Florida’s first round match-up with Virginia will be an interesting clash of styles. The Cavaliers are a basically a mirror-image of the Gators, boasting the fifth ranked defense and the 106th ranked offense. Virginia has done an excellent job defending the three-point line, allowing opponents to shoot just .295 on three-point attempts (13th best in the nation). The Gators will have to rely less on the three-pointer, so Patric Young (10.3 ppg, 6.4 rpg, 1.2 apg) will have to have a big day if the Gators are to advance to the round of 32. Kerron Johnson’s Belmont Bruins are not your typical 14-seed. After losing to Wisconsin in the first round of last year’s tournament, Belmont is back for more. The Bruins are in the tournament for the fifth time since 2006 and are looking to notch a victory for the first time. This could definitely be their year. The Bruins, winners of 14 straight, are one the strongest 14 seeds in recent memory. They’re ranked No. 23 by KenPom, which equates to being a 5-seed. That’s rough news for Georgetown, a team that has lost to 10-seed Davidson, 14-seed Ohio and 11-seed VCU in their last three tournament appearances. The Bruins are deep and experienced. Eight players average at least 13 minutes of action per game, and all eight of those players saw time in the last year’s NCAA Tournament game. Belmont also has a highly efficient offense. The Bruins rank 13th in offensive efficiency overall and four players have an offensive rating higher than 115.0. The Bruins shoot a very high percentage (55.7 effective field goal percentage, fifth in the nation) and turn the ball over at a low rate (17.6 turnover percentage, 35th in the nation). The Bruins are led by junior Kerron Johnson (14.1 ppg, 3.1 rpg, 5.2 apg). The 6-1 guard has a superb offensive rating of 121.0 and leads the team in both scoring and assists. Johnson’s assist rate of 33.6 is the 47th best mark in the country. Senior Drew Hanlen (10.9 ppg, 3.4 rpg, 3.8 apg) is one of the sharpest shooters in the country. Hanlen ranks ninth in effective field goal percentage (65.1) and 14th in true shooting percentage (66.3). The 5-11 guard is a deadly three-point shooter, he connected on .481 percent of his attempts behind the arc this season. Senior Scott Saunders (10.2 ppg, 5.0 rpg) , the team’s sixth man, is the best rebounder on the Bruins. Saunders grabbed 10.4 percent of available boards on offense, and 22.8 percent on defense. The 6-10 forward also averaged 10.2 points per game in just 17 minutes of action. I think the Bruins have a pretty good chance of knocking off the Hoyas. Even though Georgetown has been vulnerable to early round defeats, I think my previous statement says more about Belmont than it does the Hoyas. Belmont is a highly skilled team, much better than a typical 14 seed. I don’t think too highly of San Diego State or NC State, so I think the Bruins actually have a pretty good shot of reaching the Sweet 16 in St. Louis. Experience and strong guard play goes a long way in the NCAA Tournament, and Belmont has both. As always, all tempo-free stats came from KenPom. All other stats came from ESPN. 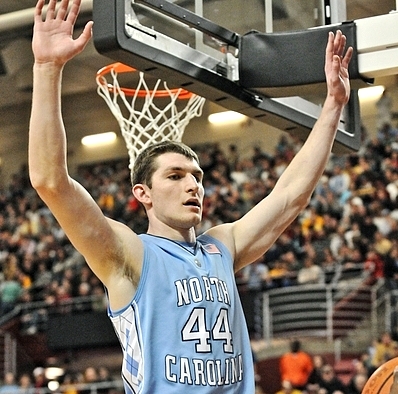 Tyler Zeller is one of three Tar Heels that made our All-ACC First Team. Scott’s offensive rating of 117.2 ranks first in the ACC and fourth in the nation among players who used at least 28 percent of their team’s possessions. More on Scott later. Barnes might not have put together an All-American type season, but he still played well enough to make the ACC’s first team. The native Iowan ranks second in the conference in points per game (17.7), and his offensive rating of 112.2 is third among ACC players who used at least 24 percent of their team’s possessions. Zeller has probably been the Tar Heels’ best player this season. His offensive rating of 120.7 ranks first in the ACC and eighth in the country among players who used at least 24 percent of their team’s possessions. He ranks 10th in the conference in defensive rebounding percentage (19.1) and 11th in offensive rebounding percentage (14.6). Marshall’s twitter handle is @kbutter5, and his passes on the court are just as smooth. His assist rate of 43.4 ranks first in the ACC and sixth in the nation. It was a really though call between Rivers and Miami’s Durand Scott. I went with Rivers because his play has gotten better and better as the year’s gone on, and I believe he’s the biggest reason the Blue Devils are ranked No. 3 in the country. When the game’s on the line, Rivers is a stone cold killer. 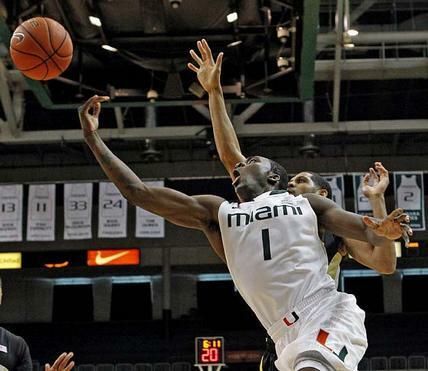 Miami’s Durand Scott has been a stat-stuffer this season. C.J. Harris had a solid season for a poor Demon Deacons team. 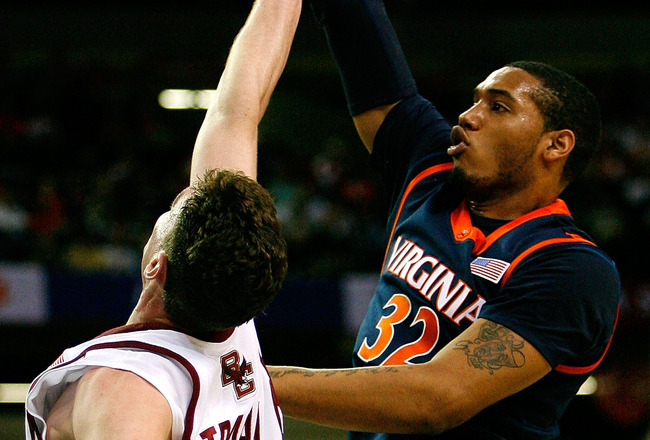 Mike Scott might not be known across the country, but the Virginia forward was a beast this season. Mike Scott might be the most under-appreciated player in the country. The junior forward is an efficient scorer, posting an effective field goal percentage of 58.3 (2nd in ACC) and a true shooting percentage of 62.9 (1st in the ACC). Scott was also one of the most dominant rebounders in the conference, grabbing 23.9 percent of the available boards on the defensive end (3rd in the ACC) and 10.1 percent on offense (13th in the ACC). Scott’s offensive rating of 117.2 ranks first in the ACC and fourth in the nation among players who used at least 28 percent of their team’s possessions. Doc’s kid is a stone cold assassin when the game’s on the line. After taking some time to get used to the college game, Rivers has come on strong at the end of the year. His game-winner against North Carolina ranks as one of the most memorable moments of the regular season. The freshman’s improved play is one of the biggest reasons why the Blue Devils have moved up to No. 3 in the polls and are in line to receive a one-seed in the NCAA Tournament. Henson has been a great defensive rebounder and shot-blocker this season. Henson ranks second in the ACC in defensive rebound percentage (24.7) and first in block percentage (10.1). Coach K and Duke will play for the ACC regular season title on Saturday. The Blue Devils lost the No. 1 overall draft pick (Kyrie Irving) and two four-year contributors who led Duke to the 2010 National Title (Nolan Smith and Kyle Singler), yet Duke is ranked No. 3 in the nation and is in line to receive a one-seed in the NCAA Tournament. 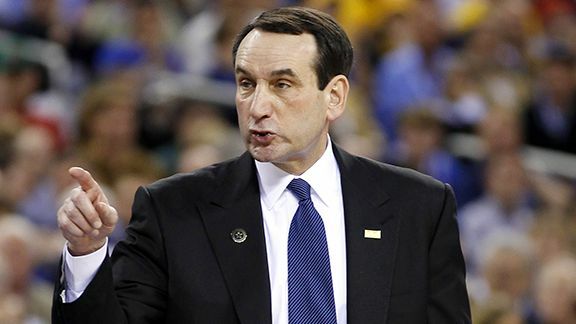 Coach K has done a great job turning this year’s Blue Devils into a final four contender. As always, all advanced stats came from Ken Pomeroy’s amazing website. 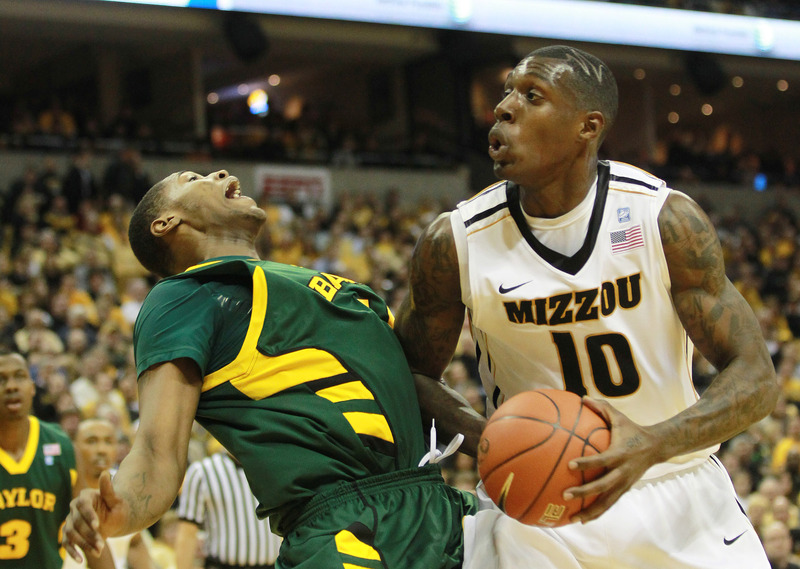 Will defense keep Ricardo Ratliffe and Mizzou out of the Final Four? – 2010 and 2011 were the only years where the average rank for both offense (26.25) and defense (41) were above 10. – 2004 and 2008 were the only years where the average rank for both offense (9 in ’04 and 3.5 in ’08) and defense (6 in ’04 and 9 in ’08) were below 10. – Of the 36 teams that made the Final Four between 2003 and 2011, just seven had an offense or defense that ranked outside the top 30. Four of those teams ranked outside the top 30 on one side of the ball, but made up for it with a top five ranking in the other category. One team, George Mason, ranked 49th in offense, but had a top 20 defense (18th). However, things got really weird in 2011. VCU and Butler had both offenses and defenses that ranked outside the top 30. Their runs to the Final Four were unprecedented, and tremendously fun to watch. What Does This Mean For the 2012 Tournament? Well, not too much. As we especially saw last season, anything can happen in the NCAA Tournament. It’s what makes college basketball so beautiful and exhilarating. But looking at the average rankings of previous Final Four teams, we can see which teams are in the best shape to make a deep tournament run. 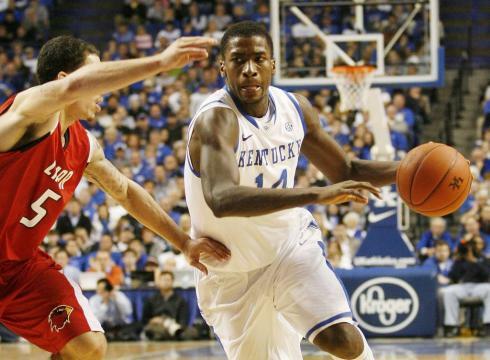 Michael Kidd-Gilchrist and Kentucky currently rank in the top 10 of KenPom’s adjusted offensive and defensive ratings. As of Feb. 25, two teams rank in the top ten in both offensive and defensive efficiency: Kentucky (3rd and 8th) and Kansas (10th and 4th). Four teams are close to being in the top ten in both categories, and could reach that accomplishment by the time the NCAA Tournament begins next month: Michigan State (12th and 2nd), Ohio State (14th and 1st), Syracuse (9th and 13th) and North Carolina (11th and 14th). -2008 was one hell of a year. UCLA – with Kevin Love, Russell Westbrook, Darren Collison, Arron Afflalo and Luc-Richard Mbah a Moute – was just the third best team in the nation that season. Also, according to KenPom, 2008 Kansas (.9859) is the only team since 2003 to have a pythagorean winning percentage over 98 percent. -2011 was odd. Three teams ranked in the top ten in both categories, yet none of those squads made the Final Four. 2008 was the only other time three teams fit that specification, and all three made the Final Four that year. Drew Gordon and New Mexico have taken control of the Mountain West. 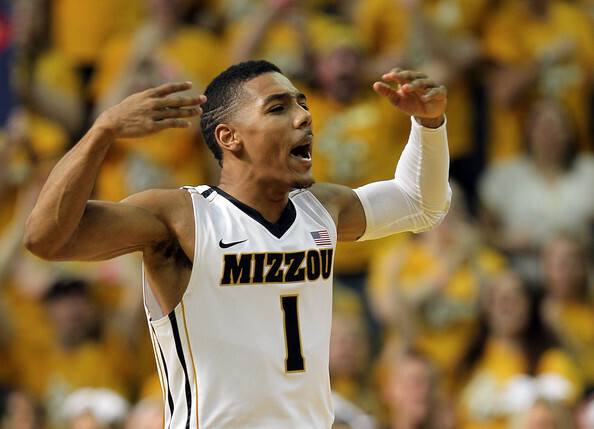 Phil Pressey’s Tigers will be put to the test twice this week. Three teams currently sitting on the edge of the bubble have great opportunities to notch a win against a ranked opponent at home. Northwestern knocked off Michigan State in Evanston in January, and a win against the Wolverines would go a long way in the Wildcats’ quest to make their first ever appearance in the NCAA Tournament. NC State’s resume is sorely missing a marquee win, and the Wolfpack blew a golden opportunity last week when they let a 20 point lead evaporate against Duke. Seton Hall would probably be in the Tournament if the season ended right now, but currently their best win is either against West Virginia or UConn. A win over the top-1o Hoyas would be a major statement for the Pirates, who have lost eight of their last 11 games. The Tigers were able to avenge one of their two losses on the year by beating Oklahoma State last week. Can Mizzou avenge the other loss this week when K-State comes in to Columbia? It could be a challenge, the Wildcats beat Mizzou by 16 in January and are a fresh off an impressive road victory against Baylor. A win over the Tigers would basically lock the Wildcats into the NCAA Tournament. Having already beaten Duke and North Carolina, the Seminoles will be looking for the their third win against a top-10 team this season. Michael Snaer’s buzzer-beater gave the Seminoles the victory over the Blue Devils when the two teams played last month at Cameron Indoor. Duke has won four straight games since losing to Miami at home on Super Bowl Sunday. The Noles have a pretty good resume, and could be looking at a top-4 seed in the NCAA Tournament. Of course, that’s only if they avoid more ugly losses like the one they had against awful Boston College. It’s a rare college basketball game worth watching on a Friday night. Marquette has been on a role lately, winning 10 of their last 11 games, and suddenly, the Golden Eagles look like a Final Four contender. The Mountaineers on the other hand, have lost five of their last seven contests. While Huggins’ crew is still safely in the tournament field, a win over Marquette would definitely improve their somewhat soft resume. Virginia has had a solid season, but the Cavaliers have yet to win a game against any of the other top ACC teams. The Wahoos dropped games on the road against Duke, Carolina and Florida State, but they get the Tar Heels and Noles at home in the next week. The Heels have done a nice job bouncing back from their loss against Duke, but they face two tough road tests this week at Virginia and NC State. A 2-0 week would be very impressive, but that’s the kind of output we expected from the Heels this season. Get ready to hear all about how this could be the last time these two great rivals play against each for a very long time. Like, all of two weeks when they could face off in the Big 12 title game. We got a great, close game when these teams played three weeks ago, and I expect another good one this time around. Hopefully there won’t be as many questionable calls from the refs. The rivalry between the Badgers and Buckeyes has really escalated in the last year and half, in both football and basketball. After knocking of the N0. 1 Buckeyes in football and basketball last season, the Badgers have lost three straight games to Ohio State in the two sports combined. For the rivalry to truly continue, Wisconsin will have to start winning against the Buckeyes. Perhaps that will start this weekend when Bo Ryan’s team travels to Columbus. The Badgers lost to the Buckeyes at home earlier this month, but Ohio State has struggled at home recently, barely beating Purdue before losing to Michigan State. Ohio State will be trying to sweep the season series from the Badgers for the first time since Ryan became head coach of the Badgers. Thomas Robinson got the best of Perry Jones when they matched up in January. Kansas at Baylor, 6 p.m.
Future lottery picks Perry Jones and Thomas Robinson battle again. Robinson and the Jayhawks beat the Bears last month. Georgetown at Syracuse, 6 p.m.
Will Syracuse lose another regular season game? Duke at North Carolina, 8 p.m. This might be the best night of college hoops of the regular season. Three match-ups of top 15 teams. St. Mary’s at Gonzaga, 10 p.m. The Gaels bring an unbeaten conference record 12 game winning streak into Spokane. St. Mary’s won the first game between these two. 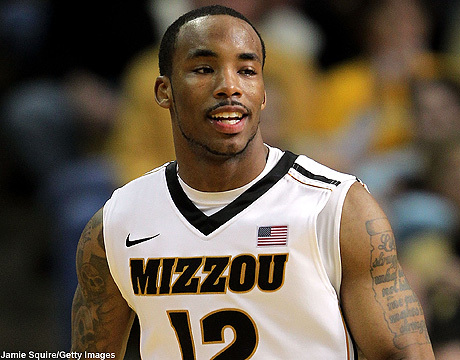 Mizzou’s Marcus Denmon came up clutch against Kansas on Feb. 4. Baylor at Mizzou, 12:45 p.m.
Mizzou went into Waco and beat the Bears last month. Can Baylor return the favor in Columbia? Will the winner of this game get a one-seed in the tourney? Wichita State at Creighton, 4 p.m. The two best teams in the Missouri Valley Conference face off in Omaha. The Blue Jays bested the Shockers in Wichita on New Year’s Eve. Kentucky at Vanderbilt, 8 p.m. The No. 1 Wildcats put their unblemished conference record on the line against a talented Commodore team. Syracuse at Louisville, 6 p.m. This is will probably be the Orange’s toughest remaining road test. New Mexico at San Diego State, 9 p.m.
Two of the best teams in the Mountain go toe-to-toe in San Diego. 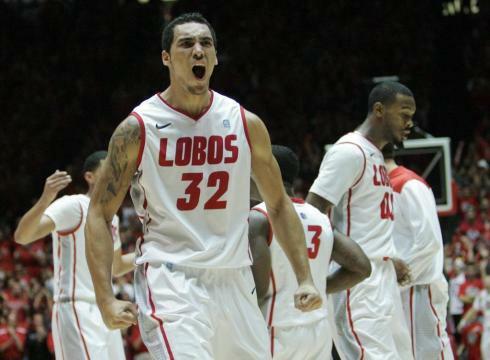 The Lobos beat the Aztecs in Albuquerque last month. Wisconsin at Michigan State, 6 p.m. The Spartans beat the Badgers in Madison last month in OT. Can Bo return the favor and beat Izzo in East Lansing? Mike Moser has been a beast this season for the Rebels. 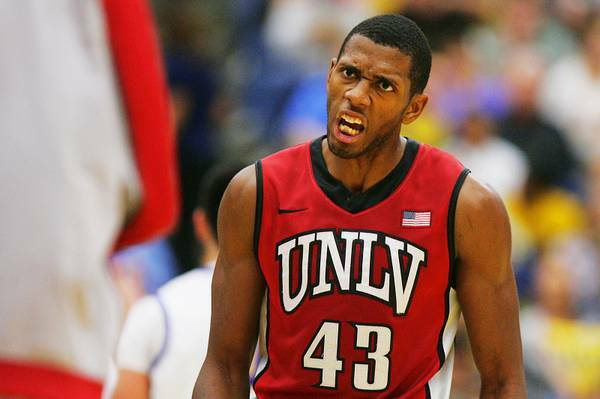 UNLV at New Mexico, 12 p.m.
Mike Moser and the Rebels will try to knock off the Lobos in The Pit. St. Mary’s at Murray State, 5 p.m.
Perhaps the top two mid-major teams face off in a BracketBusters game. Can the Gaels ruin the Racers’ quest for perfection? Ohio State at Michigan, 8 p.m.
Michigan played the Buckeyes tough in Columbus but lost. Can the Wolverines contain Jared Sullinger? Long Beach State at Creighton, 9 p.m.
Casper Ware faces off with Doug McDermott. Which team will strengthen their at-large profile? Duke at Florida State, 6 p.m.
Michael Snaer’s buzzer beater gave the Seminoles an upset win at Cameron Indoor last month. 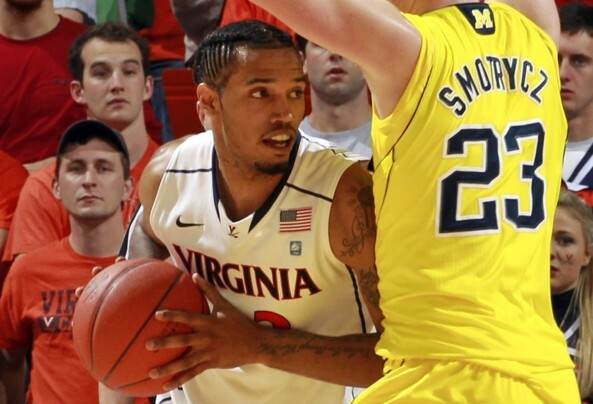 Virginia’s Mike Scott is one of the most underrated players in the country. North Carolina at Virginia, 3 p.m. The Tar Heels face a tough conference foe on the road. Mizzou at Kansas, 3 p.m. The last regular season Border War for the foreseeable future. Wisconsin at Ohio State, 5 p.m.
Deal with it. 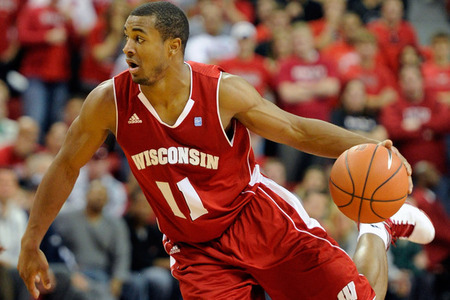 The Badgers try to avenge their home loss to the Buckeyes. Michigan State at Indiana, 6 p.m. The Hoosiers knocked off Kentucky and Ohio State at home, can they add the Spartans to the list? Florida at Vanderbilt, 8 p.m.
Two solid SEC teams battle in Nashville. Florida St at Virginia, 6 p.m. The first match-up was great, can the Wahoos get back at the Noles with a win at home? Georgetown at Marquette, 12 p.m.
Two of the best teams in the Big East face off in Milwaukee. North Carolina at Duke, 6 p.m. The best rivalry in college hoops. 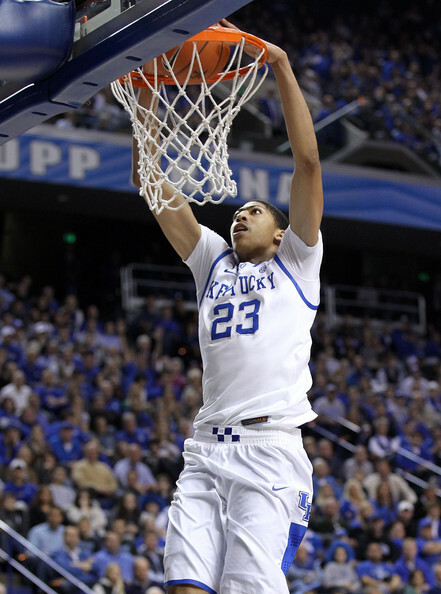 Anthony Davis slams it home. Ohio State at Michigan State, 11 a.m.
Draymond Green and Jared Sullinger face-off in East Lansing. Could this game determine who wins the Big Ten regular season title and Big Ten player of the year? Kentucky at Florida, 11 a.m. The Wildcats face another road test in Gainesville. Patric Young tries to contain Anthony Davis and his unibrow.